Unfortunately, we're SOLD OUT, and waitlist is full. Stay tuned for information on a future Art Museum Reception/Tour. 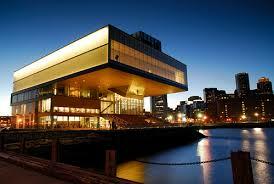 The Institute of Contempory Art is located in the Seaport District of Boston and is known for its dynamic contemporary art exhibits, and a fabulous view of Boston Harbor. Date: Friday, September 16 from 6:30 - 8:30 PM. Tour begins promptly at 6:30pm, followed by a reception in the Water Cafe. Parking: Due to construction in the surrounding areas, paid-lot parking options have changed. There are numerous parking spaces both facing and adjacent to the ICA. On-street metered parking can be found along Northern Ave., Seaport Ave. (adjacent and in front of the ICA), and several side streets in the surrounding neighborhood. For more information, please click HERE.